Photographer, explorer, author and filmmaker Denis Belliveau visited Harker on March 22 as the final guest of the 2015-16 Harker Speaker Series season. 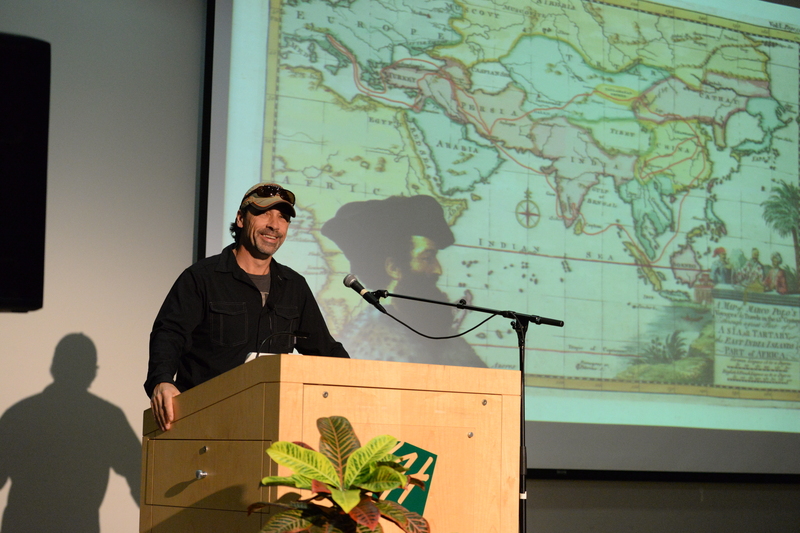 Using photographs and his unique storytelling ability, he gave the audience a 40-minute summary of his two-year journey to retrace the legendary travels of explorer Marco Polo. This story was told in the 2008 documentary “In the Footsteps of Marco Polo” and later in a book by the same name. Before explaining why he decided to traverse the path Marco Polo traveled more than 700 years ago, Belliveau briefly discussed Polo’s life. Polo was the son and nephew of Venetian merchants who left Venice for Asia before he was born. Upon returning to Venice, the two merchants met the teenage Marco for the first time and set off again for Asia, this time with Marco in tow. Polo’s stories of his travels would later become what Belliveau called “the first travel book.” He explained that Marco Polo was the first to leave behind a detailed account of his time in Asia, inspiring many later explorers, including Christopher Columbus. “His personal story reads like a fairy tale,” Belliveau remarked. In 1992, which marked the 500th anniversary of Columbus’ voyage to North America, Belliveau and fellow traveler Francis O’Donnell observed that many were retracing Columbus’ journey, which they dismissed as boring. “You spend six weeks at sea and then you’re in the Caribbean,” he said. They realized that 1995 would be the 700th anniversary of Marco Polo’s return to Venice, and began discussing the prospect of retracing his 15,000-mile trek through Asia and back. It turned out that many attempts at a similar journey had been made in the last several decades, but none had been successful. Belliveau recapped the journey through select photographs he took while traveling. In one slide, he showed the audience a woodcut of Marco Polo returning to his home in Venice, saying he’d hoped to find this same place in his travels. The next slide showed a photograph of the home, with many features still preserved, including the cross above the archway that formed the front door. While in Israel, Belliveau and O’Donnell visited the Church of the Holy Sepulchre, which Marco Polo journeyed to at the request of Mongol Emperor Kublai Khan. There, Belliveau gained entrance by consulting the family in charge of opening the main gate. The same family has maintained this arrangement for eight centuries, he explained. To get across Afghanistan safely, the two travelers had to make arrangements with the Mujahideen, the guerilla military outfits that fought against the Soviet Union. Their group was ambushed the Hazaras and they were held for several hours before being allowed to travel again. Eventually they made their way to the famous Wakhan Corridor en route to China. Following his talk, Belliveau answered questions from the audience and signed copies of the book that accompanied his film, which can be viewed in its entirety at www.thestepsofpolo.org.